I have always thought the Whittley CR 2800 was a first class combination caravan and cruiser. 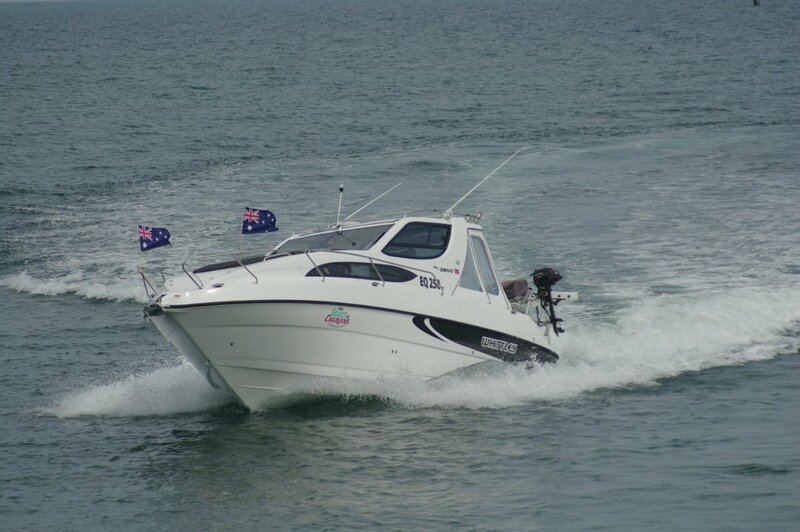 The more usual compromise of caravan and roof top tinny works for inshore fishing experiences, but this vessel gives nothing away in caravan-quality living on the hard stuff while allowing Montebello, Shark Bay and King Sound type experiences afloat. 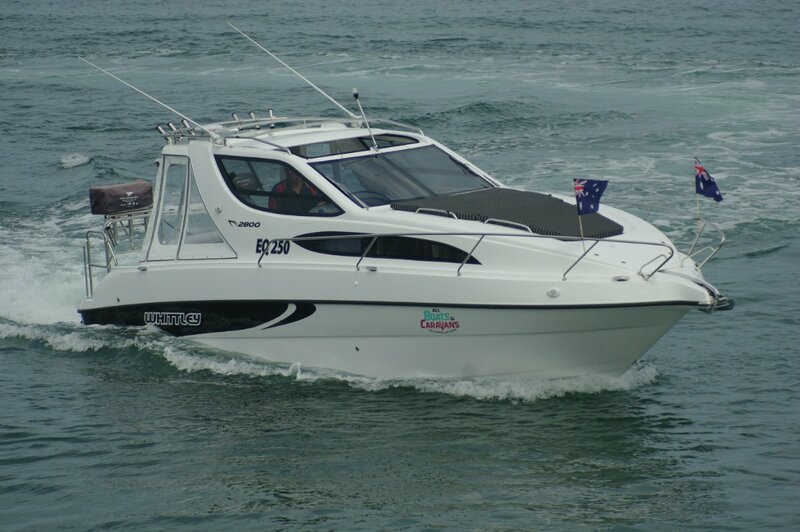 The buyer of the review boat is in no doubt about its far ranging abilities, and even ordered air conditioning and extra large fuel and water tanks to suit it for the Kimberley. The 2800 has a sports cruiser-ish layout, apart from a hardtop that extends to the rear of the cockpit. This carries the neat screens and clears that convert the cockpit into a large second cabin at night. By day it is far airier. Remove the screens, open the sliding roof and you have an outdoor experience. There is another thing to do if you had four people overnight: remove the infill that created a double bed and clip it into its nest under the hardtop. Bedding, clothing and other passengers’ gear disappears into the astonishing quantity of storage cunningly disposed around the cockpit, leaving seating for everyone including a bunch of day guests. With just two on board overnight, the forward accommodation fits the entire domestic bill. 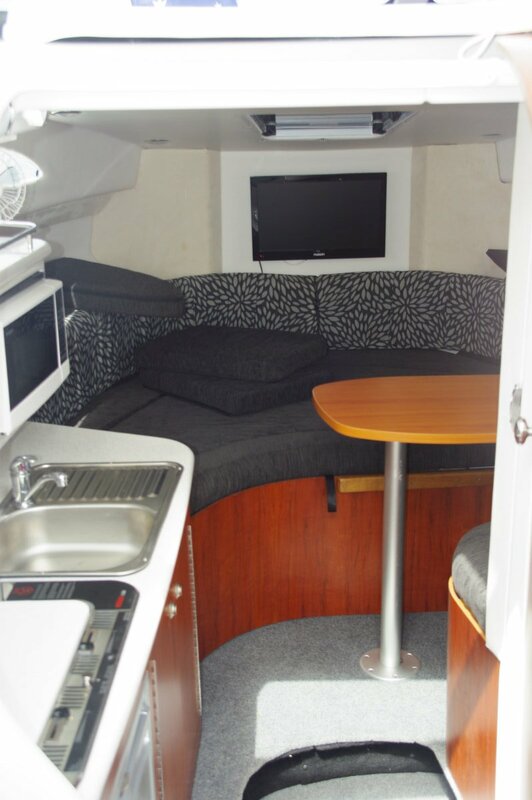 The wrap around dinette converts to a full size double bed; the galley unit has a fridge, sink and two-burner stove as well as a microwave (and solar panel, inverter and triple batteries to cope); the bathroom is a genuine room with good space for all functions. Naturally there is full headroom everywhere. The cockpit by day easily accommodates the recommended maximum of nine, but there is extra space available on the swim platform. 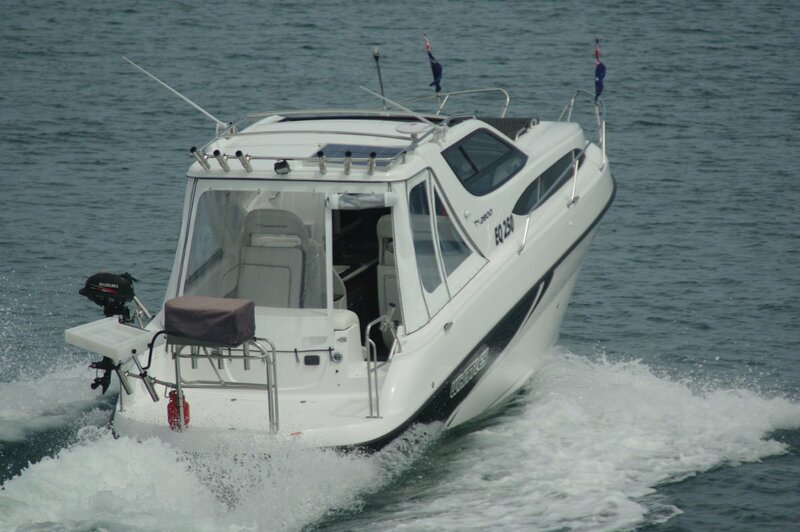 This is probably the largest of its kind on any trailable boat and would make a commanding patio in a caravan park. At sea or at anchor it has many more uses. Railed for security, it provides room for two to fish in comfort, and the buyer chose to fit a bait table to complement the bank of rod holders across the hardtop end. 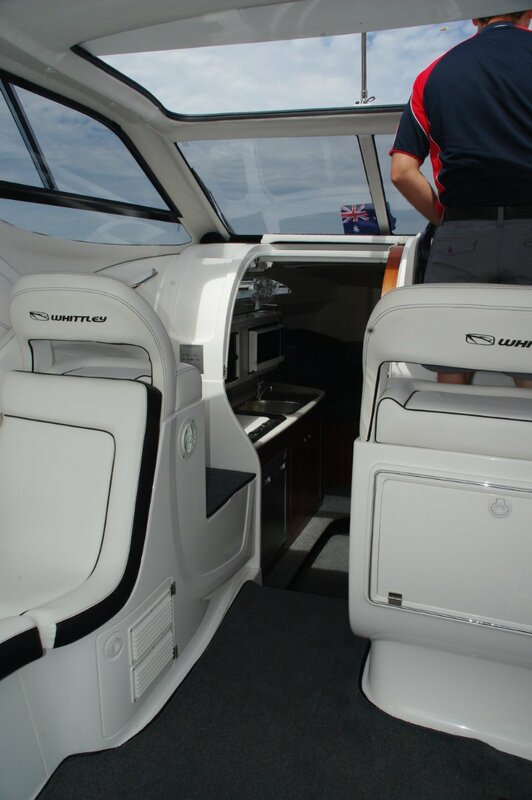 It also provides deckchair space for sundowner drinks, a barbecue area, and storage for the tender’s outboard. Bigger items like surfboards and kayaks can be carried on the roof rack formed by the hardtop’s grab rails. The elevated driving position faces a dashboard containing a pair of analogue gauges for engine and boat speeds, but with everything else from the digital age. Starting, for instance, is by a button that recognizes the owner’s fingerprint (although there is an overriding remote). Instead of a bank of light switches there is a touch screen with pictures illustrating the lights’ position and function. 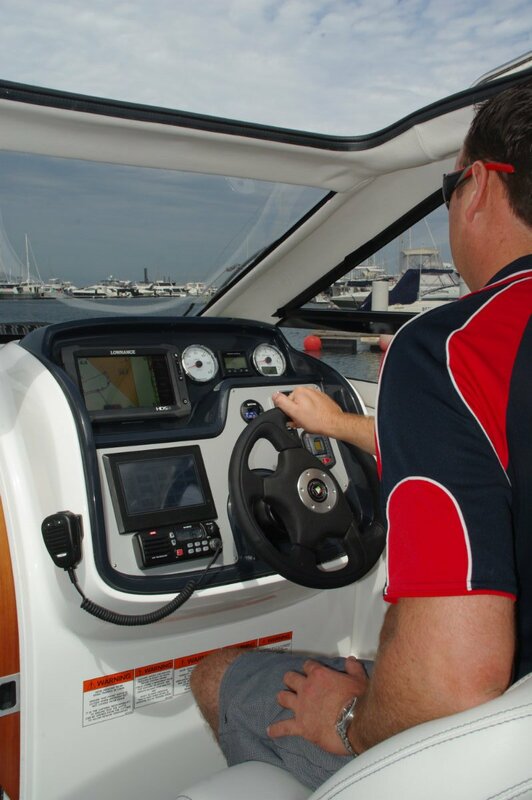 The navigation console, a Lowrance HDS9, is also touch screen. The VHF radio, though, is the familiar kind and handily placed. The sliding roof allows the driver to stand on his seat for a commanding view. This would be especially useful in unfamiliar shallows, the elevated viewpoint making it easier to pick out the lumps. 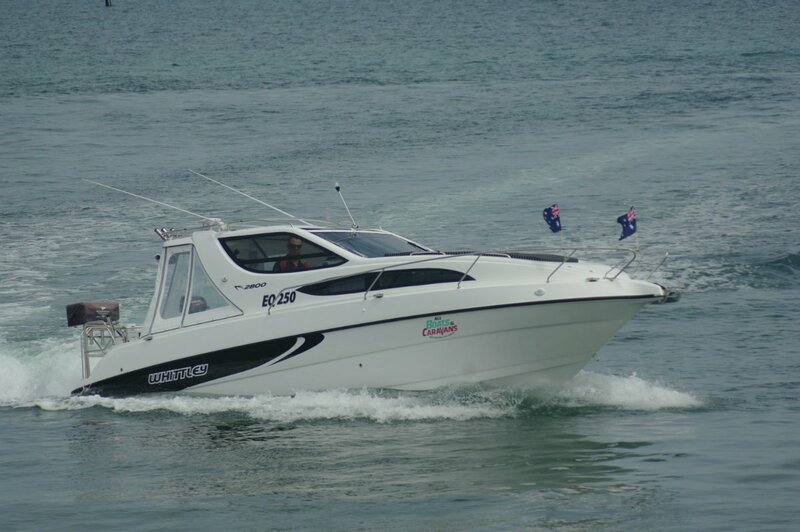 The standard power plant is a Volvo Penta V8 putting out 300hp. It has a lot more cubes than an outboard of similar output, and this shows with a big application of throttle - acceleration is instant and prodigious. If you had a mind to you could take a handful of skiers under tow at once. Their observer is provided with the finest of positions: a rear facing lounge with raised back. The Whittley CR 2800 packs all this capability into a package towable by a standard large 4WD, and with a rule-free 2.5m beam.